holidays and vacations to climb the trekking peaks in Europe and Worldwide. OFFERS mountain holiday offers & late deals! A not-for-profit organisation offering trekking Trekking Peak holidays in the Nepali Himalaya. The easiest peaks offered are Yala Peak and Pokalde which are not technically difficult. Harder, and at significant altitude, are Island Peak, Mera Peak, Lobuje East and Teng Kongma – these are available to experienced trekkers who've previously trekked at altitude. All trips require experience of winter mountaineering skills. Specialist Mt. Fuji guiding company with bilingual, fluent English/Japanese speaking guides. Trek with highly qualified guides to the summit of this, the World's most recognizable mountain and symbol of the country. Unique and authentic global adventure travel experiences for people prepared to go beyond conventional tourism. G Adventures offer a wide range of walking and trekking trips, including visits to many of the world's trekking peaks. Adventure travel including trekking peaks in the Himalaya, includes climbing trips to Island Peak and Ama Dablam, and treks such as Everest and Kangchenjunga base camps. There are also a range of special trips with some unusual choices. Small group tours and luxury customized vacations in unspoilt Sicily, the island of culture and history. Visit the iconic cites like Palermo, Agrigento and Taormina; be amazed by the Valley of the Temples; scale an active volcano (Mount Etna), and enjoy Sicilian food, wine and culture. A specialist at organizing Kilimanjaro challenge events, with over thirty Kilimanjaro group departures arranged every year. Join a group to climb Mount Kilimanjaro on the Lemosho, Rongai, or Machame routes, and fundraise for charity. Discover the adventure and wild beauty of Borneo: stay in jungle lodges, listen to the sounds of hornbills, spot endangered orangutans, take a mountain trek above the clouds on Mt Kinabalu, meet indigenous tribes and relax with some down time on the tropical island paradise of Lankayan Island. Tailor-made luxury holidays to Africa and Asia, specialising in active family holidays, luxury honeymoons and safari holidays, and trips combining world class game viewing with beautiful beaches. Wayfairer offer totally bespoke travel itineraries designed by luxury travel experts, with great attention to detail, local knowledge and exacting logistical management. 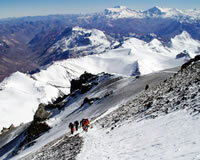 Expedition and climbing guide service offering a range of mountaineering and trekking trips to Aconcagua in Argentina. Mountaineering company EAI specialises in ascents of the highest volcanic peaks in Ecuador, in particular Cotopaxi and Chimborazo. Trekking in the Himalayas of Nepal and Sikkim – founded by Tenzing Norgay Sherpa (the first person to climb Mt Everest, along with Sir Edmund Hillary) and now run by his son, Jamling Tenzing Norgay, Tenzing Norgay Adventures pioneered trekking in the Himalayas. A trekking walk/climb using the scenic Machame route to the summit of Kilimanjaro and back. This route is also know as the 'Whiskey Route' because of its harder challenge; it passes through magnificent forest, traverses a ridge through moorland and onto high-alpine desert with stunning ice field views and amazing views of Kilimanjaro peak. This small group, 8-day trip, camps along the route and is supported by local guides and porters. At Travel-Quest we use the term 'trekking peak' in its broadest sense and define it as a non-technical climb on a high altitude mountain – an ascent that can be attempted by any reasonably fit individual without previous experience of roped climbing. An experienced mountain guide will generally be employed on trekking peaks. Trekking peaks will vary in their degree of difficulty and the harder ones may require some use of technical mountaineering equipment such as ropes, crampons and ice axes. Altitude comes into the definition as well, some sources stipulate that the peak has to be over 4,000 m, while others specify that it is also below 7,000 m – here are Travel-Quest we are happy to be more relaxed about this definition and will also include mountains at lower altitudes. To confuse the issue the Nepalese Mountaineering Association (NMA) has classed a number of Nepali peaks as 'Trekking Peaks', but many of these require more significant climbing and mountaineering skills than would be required on any other trekking peaks. You'll find that many trip providers have their own specific definitions of a 'trekking peak', take care to read and check that the trip is the right grade and skill level for you. What's the difference between trekking and mountaineering? Our view is that trekking more often implies a journey, while mountaineering involves a target – the summit! Generally trekking can be done without needed any/much specialist or technical equipment, while mountaineering needs kit like ropes, harnesses, crampons and ice axes and is generally more physically challenging. Mountaineering will usually also call for experience and training in things like navigation, rope technique and avalanche awareness. See our dedicated section for mountaineering trips or our trekking and walking section for general treks. The travel-quest trekking peaks section lists expeditions, holidays, tours and vacations that involve trekking high altitude peaks. See the definition at the top of the page for more details.